First Posted on December 17th, 2012. Links here may have been disconnected. If you’d like more information about the courses, programs and audios, please email us and we’ll be happy to fill you in! In this Issue of “Quickening the Rhythms of Change” Scroll down to read your favorite parts. There you will see the Crown of the Goddess. The Northern Castle of Initiation, Caer Sidi. Queen of the moon, the sea and the stars. Arianrhod guides our souls into the upper world. 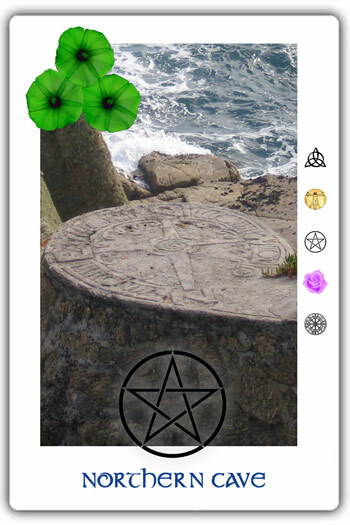 In times of ascension information overload and outer world chaos, go within, into your sovereign center, invoking the energies of the Goddess through the eight spokes on the Celtic Wheel of the Year. Like the eight limbs of yoga growing out of the rooted tree’s trunk, the Celtic wheel of life has eight seasonal spokes originating from a central hub or well of sovereignty. Often represented by triple goddess iconography, each turn of the wheel guides us through the seasons, their energies and symbolism. Whether that movement is gauged in the cycles of annual or daily time; by the inner rhythms of our relationship to known and unknown forces; or with the four winds of the galactic overlay; each cycle builds on the first, encouraging us to grow into our sense of spirit embodied. We are holograms for the divine and its elemental origins are imprinted in our cells; with intention and practice, we come to the spiritual threshold, a place of integrity with a view to autonomy and oneness with the divine inside. This what the yogis called samadhi and what the Celts embraced as the descending energy of the divine. Simply light a large center candle and eight votives or tea lights around that center representing the four winds, their elemental symbolism and the four harvest celebrations in between. Sit quietly, breathing in the energy of the Goddess. The feminine divine will heal your boy, your heart and soul. As the Goddess moves through you, the energy will heal the world. During the season of Samhain, we began the long journey back to our origins, returning to a time before birth where we curl up in the Mother’s womb. We celebrate this return to the Mother at midwinter, the time of longest dark and shortest light. Winter is a time for inner world magic, dreaming, healing, visioning, birth, death and rebirth. It is a time when the light is born again. On this Solstice point, or Yule, we stop for a moment, basking in the last of the Sun’s waning light and the first of the expanding light. From here we move even further inward, gathering patience and courage to go deep into stillness for a timely respite. Inside the great womb of all earthly life, we experience sensations of safety, the murmurings of those who lie sleeping, and scents of the dank and musty soil, our earthen bones. In this container we are enveloped by darkness, accompanied only by our inner vision and our desire to grow. This is the place and the time when we rest, restoring and healing for a while, before making our way back into the light, bit by bit, as inspiration beckons, awakening us again at Imbolc on Brighid’s Day. On the shortest day of the year, a thin finger of dawn light passes into the aperture of Brugh na Boinne, otherwise k nown as Newgrange in Ireland. This megalithic enclosure was erected long before the Celtic peoples arrived in Ireland. We can all experience the wonder of this day if we rise before dawn to trace the track of the sun’s turas (journey) on this, the shortest day of the year. “The Celtic Way of Seeing, “ by Frank MacEowen. At Winter Solstice in Ireland, Newgrange is best known for the illumination of its passage and chamber by the winter solstice sun. There is a rooftop opening, which allows sunlight to penetrate the passage and chamber at sunrise around the Winter Solstice. Once it reaches the floor of the chamber, it gradually extends to the rear of the passage. As the sun rises higher, the beam widens within the chamber, illuminating the whole room for approximately 15 minutes, and then it leaves, retreating back down the passage. Ancient Celts and their ancestors savored this very brief moment each year as the wheel slowly turned toward the light of Spring. In Avalon, the spiraling path (remains of a three dimensional seven circuit Labyrinth) leading up the slopes of the Tor takes us to Caer Sidi (also Caer Arianrhod). In the heavens, this castle is the Corona Borealis, or Crown of the North Wind. Araidne & Araianrhod are the same: Ariadne rules the inner worlds, Arianrhod the upper world. In the underworld of Annwn, their sister Nolava is the crone and keeper of the cauldron. The three worlds are joined by the world axis—envisioned as a holy mountain, which here in Avalon is the tor. “Priestess of Avalon, Priestess of the Goddess,” by Kathy Jones. Like Sophia, Arianrhod is a mother of god. 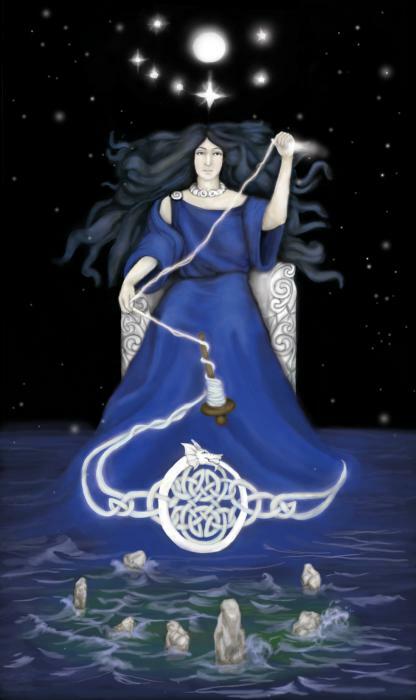 A Welsh Celtic Goddess of the moon, stars and the sky, her name means “Silver Wheel,” or “Silver Circle.” Arianrhod is the goddess of the wheel of the year, the full moon, destiny, fertility, feminine power, birth, death and reincarnation. She is the daughter of Don, whose Irish counterpart is Danu of the Tuatha De Danann. Known as a triple goddess, she has triune relationships with Blodeuwedd & Morrigu; Blodeuwedd & Cerridwen. Some of her other identities are “virgin white goddess of birth, initiation, death & rebirth,” and the “silver wheel that descends into the sea.” Her’s is the “Castle of the Silver Wheel,” a northern revolving castle, which is sometimes referred to as the great turning island surrounded by the sea in the sky. Astronomically speaking, Caer Arianrhod is sometimes known as the Pole Star, seen only and always in the northern skies of the Milky Way. It can be found off the tip of Ursa Major, the Big Dipper. Some say her castle is the Aurora Borealis or Milky Way and therefore, the heavens swirl around her castle. Others say that Caer Arianrhod is the constellation, Corona Borealis–her Greek counterpart Ariadne’s Crown. As the Celtic goddess of time, her Silver Wheel represents life and karma as she embodies the turning of the year on the Celtic Wheel of Life. Some of her other symbols are the cauldron—a symbol of feminine power; the white sow—signifying connection to the underworld; the northern Pole Star and the upper world where she reigns at Caer Arianrhod which is also known as Caer Sidi. She is specifically associated with the winter season because she rebirths the Sun every year at the Solstice. Caer Sidi is known as the otherworldly tower of initiation, a place between time, where souls reside after death before their next incarnation. In some myths, Arianrhod is said to ferry a boat known as the Oar Wheel, carrying the souls of dead warriors to Emania, or Moon-land, where they would then reside until they reincarnated. If you’d like to learn more about Arianrhod and the symbolism of Winter Solstice, you may want to consider our correspondence course: Rhythms of the Goddess. Hail Ariahnrhod, we call on you now! Your silver wheel of light is our pole star in the night. We know you are there, as we can see your crown of stars, even from our place in Earthly life. Guide us to your castle of initiation, into the heavens to float like the moon and the stars of the upper world. Make room for us, Mother, in the blessed warmth of your cauldron, as we stop for a season to restore and heal, to learn and resurrect ourselves alongside you, as you rebirth the Sun each year. Hail Ariahrhod, we call on you now! We wade through the fiery winds and the rains of time to find the portal for your castle in the sky. Carry us in your boat, singing us home as we listen to the sounds of your oars skimming across the top of the waves. You gracefully move the boat through the gentle seas that hover in the sky, back to the Moon Land where you reign strong. Hail Ariahrhod we call on you now! Your gifts are wings to fly, and silently we make our way through the darkness of the season, grateful as we welcome the expanding light once more. We honor your knowing of the upper world, the underworld, and all other worlds. Your purpose is clear and we follow you homeward, into the realms of Caer Sidi, Caer Arianrhod, the castle of initiation and rebirth. Hail Ariahrhod we call on your now! Hail Ariahrhod! We have found our way home! Hail Arianrhod! We can rest now! Hail Arianrhod! We lie in stillness until time comes to part the veils of winter! Hail Arianrhod! We are restored! Hail Arianrhod! We have remembered the magic of the Goddess inside ourselves! Sacred Body Oracle readings are now $50 through the end of 2012. All you need do is pay and schedule your session for any future date. Email us for an invoice and to schedule an appointment. For more information about Sacred Body Oracle readings, see our new website! Every cell of your body is a divine hologram filled with wisdom waiting to be activated. The Sacred Body Cards will guide you along the inner rivers–bringing light to the little known caverns, transmuting energy for healing. Like a fractal in the universal hologram, the cells in your natural body are created from energy patterns that spring from your Blueprint, which originates from the even subtler vibration of the Spiritual Template. Although these images are still in mock-up form, the Oracle is currently working with the energy of the cards. With each turn of the Wheel, we call in power by invoking the directions, elements and Goddess archetypes of the particular season. We honor all quarters & cross quarters: Samhain, Yule(Winter Solstice), Imbolc, Eostre (Spring Equinox), Beltane, Litha (Summer, Solstice), Lughnasadh, and Mabon (Fall Equinox). Beginning at the Center of the Wheel in Sovereignty, where pure masculine and feminine forces meet in your heart, the golden energy streams through us from above and below. It is from this center point that we experience all seasons, their Quarters and Cross Quarters, the Elements and Directions. The Inner Rhythms course will guide you in awakening and embracing your awareness of the divine within you, to establish body-to spirit communication, and to help you heal yourself through your very personal spiritual Blueprint. Also known as the Etheric Body, there are many other names for this subtle field—in Yogic philosophies it is called the Pranic Body, and the ancients Egyptian alchemists called it the KA Body. Happy Solstice 2012 to All and a Blessed New Year! First Posted on October 8th, 2012. Links and photos here may have been disconnected. If you’d like more information about the courses, programs and audios, please email us and we’ll be happy to fill you in! Please scroll down to read your favorite parts. On September 12th, we entered into the annual Mayan cycle of approximately 40-days during which we moved through 10 portals into a place called “time out of time.” Each portal is one day-long in our time. Once we’ve passed through the 10 portals, we sit for a few days at the entrance to the gateway that leads into the Mystic Columns which sit in the center of our Galactic Core. For 20 days we continue to spiral even further into the deepest places of our super consciousness–our true core and human reflection of the Galactic Core vibration. After journeying in the land of Mystic Columns, we rest again for a few days on the other side of the gateway, and then spiral back out through the same 10 portals we entered on September 12th. By the time we are finished this year, it will be October 30th, just in time to breathe for one day before All Hallows Eve and Samhain! Samhain is the Celtic New Year, the time of our final harvest and a time during which we prepare for Winter. It is the beginning of our long journey inward, into the darkness of regeneration, seed germination and renewal. Various tribal cultures–Jewish, Mayan and Celtic–all understood what it meant to truly be in the flow, to honor the natural cycles of the Earth. Their rhythms were a reflection of the planetary rhythms and there were inherent times for complete surrender. At least once a year, and more likely every month, or every day in the most traditional sense of their beliefs, they went inside to speak with the Gods and Goddesses of their hearts, the Divinity as it was reflected inside of them. So on Monday, October 15, 2012, you too will be spiraling out of the Galactic Core–where you’ve been fully supported in your self-inquiry–out to rest and integrate what you’ve found, what you’ve learned. 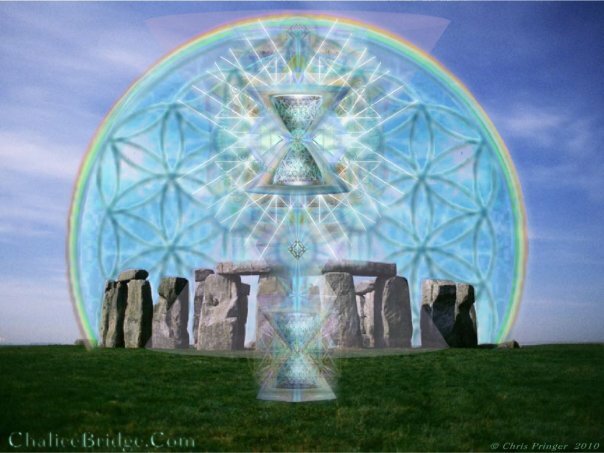 On Sunday, October 21, 2012, you will begin making your way back through the 10 portals, bringing the new higher vibration into your life in our currently changing 3-D/4-D world. It is your internal shifts, along with everyone else that was conscious on this journey, that will take the rest of the world into the 5th dimension and beyond. So even though it’s almost over, pay attention to these last several days inside the Mystic Columns. Become conscious of what you are finding, learning & creating. Bring it forth with intention and be one of those who sustains your evolution for the betterment of humanity. The inner journey is not very popular, even amongst those who might define themselves as existentialists, spiritually motivated, on the path to enlightenment, or any who simply feel they are open-hearted. Why? Because, it’s really dark in there! Besides, it’s really easy to fake being on a spiritual path. One of the less popularized (not astrology & numerology) maps for growth indicates that we are in a time of deep internal reflection right now. Can you feel it? Although the Mayan calendar–at least part of our recent interpretation of it–could be responsible for the mass increase in hyper-awareness and dramatic interpretations about “the Shift,” it also gives us a template to go within for our answers and our healing. Set up as a 260-day spiraling day keeper, the calendar outlines a constant state of spiraling into center and back out again through various portals into other dimensions. And this year, it may not be co-incidental that the core of the annual Mayan calendar spiral falls in close alignment with both the Uranus-Pluto transit square in Aries on September 19-20; the seasonal appearance of the Dark Goddess in Celtic lore, and the Jewish High Holidays. The core of the Mayan calendar experience is September 11-October 30. Rosh Hashanah is the anniversary of creation–think back to the Biblical reference to the 7 days it took God to create Heaven and Earth, Adam and Eve–and falls on on September 16-18 this year; Yom Kippur is the day of atonement, falling on September 25-26. The astrological transit has been coined by my favorite local astrologer as “shocking transformation.” The Dark Goddess refers to the times of going within, at New Moon, during the wee hours of the night, and in the Fall as our days become progressively shorter. As the wheel of the year turns westward toward the setting sun over the cosmic sea, our soul’s journey or “anam turas,” turns west as well, making its way toward TirNaNog, the magical place of youth that lies beyond our earthly sight, deep in the heather of another world. Beginning at the western balance point of equal dark and equal light, we honor the Earth as she harvests apples, nuts and grains for the last quarter of our annual journey. Before our departure, we share our abundance with deep gratitude for the community, our soul friends and their wisdom. We sing our good-byes to the extroverted and transformational fires of summer while dancing together over a light speckled sea. And then we begin the slow turn inward, curling and cuddling into a place of our own, all alone. Now, while we celebrate, the graying Mother empties her nest and gives way to the crone in perfect time with the green leaves making way for the deeper more mature colors of autumn. We no longer dance on the slick and shiny surfaces, instead allowing ourselves to be absorbed back into the hues of gold, orange, red and brown as the leaves fall quietly from their branches, soon crumbling beneath our feet. From our vantage point in the sunlight above we give way to the land below, burying ourselves in the soils of curiosity and courage. Fall Equinox, the time starting at the end of September through Halloween, is the end, the final place on the Wheel before life’s re-inception. It is a visionary time during which we prepare for the final harvest, reigniting our commitment to the cosmic plan and our search for the mysteries of the Universe inside us. In autumn we stand on the first steps, barely opening the gate to a temporary resting place after an abundant growing season, making our way inward and downward. Like Inanna, we will soon prepare and embrace the presence of our personal winter, relishing the darkness until the light shines bright again. Here we dive, sliding into our earthly womb on the element of the water that cleanses as we surrender to its currents, its turns and flows. Water transports us toward our destination at the single point of oneness and global awareness. Water speaks to water across the horizon and we soak in the fluids of its essence, taking small bites of earthly knowledge from the apples to open our hearts and minds along the way. Apples and cool river waters guide us, alchemizing knowledge into wisdom as we move slowly into the shadows. Celebrate! You have successfully turned the Wheel of the Year once again and are ready for the wisdom of your ancestors, returning to the womb for healing and rebirth. Honor the seeds you planted long ago; love the sproutlings that grew into flowers, vegetables, nuts, fruits, and grains; for now you are prepared and abundant as you give way to your evolution, turning yourself into ashes to fertilize the ground for the seeds of the new year. Each geographical region has its own elemental correspondences to the directions and seasons, though underlying all elements is that of the Earth at the harvest, abundant supplies, and gifts from the Mother. In the Isles of Brigid, autumn is symbolic of the earth element emerging from the water of summer, and the crone emerging from the Mother. Ertha and Gaia are manifestations of the autumnal equinox, though the symbolic Triple-Mother Goddess, Eiru, is best known in the Isles as a real world representative and cosmic metaphor of fertility and sovereignty. She lives in the land of women; she is the Mother of matter and performs the cleansing of Earth each year for the next planting. Eiru, along with Fodha and Banba, protects the land, evokes dedication, devotion and commitment in the people that walk on her surface. She gives us life and preserves us in the face of danger and destruction, famine and misfortune. She is the mother, coming from the maiden and giving way to the crone, who is at the root of all autumnal harvest festivals. We call on you Eiru for guidance and balance, for clarity and resolve. We thank and honor you for lighting the way into ourselves and for lighting the way outward again. Blessed are we who know you; blessed are we who honor the cycles you create for us along the spiraling path to awaken our souls. It is a route well trodden, so we fear not for our lives, making way for learning, remembering, and true focus for our intentions as ever-evolving souls. Without your benchmarks, our sovereignty is unanchored and we fly untethered into the abyss of the ethers. Instead we spend our time growing, realizing and expressing. Thank you for the arms of compassion you wrap around us, and for your elemental reflections that help to remind us of who we really are as spirits embodied. Manifesting abundance and havingness is our inherent human right and creative power. We often desire and yet cannot create what we want because we remain separate from our nature, avoiding responsibility and risk. By praying as if you already have what you want, focusing on the end point in gratitude, you will move yourself out of hopelessness toward full enlightenment. -Stand or sit comfortably with your feet on the ground, your eyes are closed. -Visualize a grounding connection from the root chakra into the center of the earth. Sit for a moment and breath, releasing stagnant energies into the earth’s core. -Allow earth energy to enter the bottom of your feet, moving into your lower body. Breathe and circulate the earth energy. -Feel the cosmic energy as it moves into your crown chakra through your body to meet and mix with the earth energies. -Breathe in and breathe out. Feel the earth and cosmic energies flowing through your body, opening the doors of knowledge and awareness, eliciting conversations with the God and Goddess of your heart. -Envision what you want in present time. Observe and ground this vision. -Create a symbol that represents what you are already manifesting. Allow your vision to flow into the symbol. -Breathe into your heart, filling it with gratitude for what you have, what you want and what you are creating. Breathe from your heart out into your symbol, into the world, into the Universal flows where your vision will manifest. -Release your vision to the Cosmos; trust that sending it away will allow it to manifest in your personal dimension and reality. Summer’s end draws back the heavy curtain for a moment, thinning the veils between worlds and expanding our awareness of the Divine. As the Wheel of the Year turns to darkness on the eve of All Soul’s Day, dusk marks the beginning of Samhain or Hallowmas, celebrating harvest and slaughter, death and rebirth, our link to the past and the ancient ones who made us. On Samhain eve we dance to the drums that pound out Earthly rhythms. We shake off old patterns, moving to the beat of our instincts, much faster than our minds are able to even think. Almost transfigured, we see into the past before it is time to go into hibernation. Bodies undulate unabashedly all around as the bonfire roars, throwing bones into the scorching heat of transformation. Healing begins as we look into the reflections of change within the flames; we begin to see ourselves and consciously sink into our ancestral roots to guide and transmute us. We intuitively call upon the wise guardians of our lineage long past, looking into their eyes for wisdom, clarity and release. As the pumpkins, squashes and gourds are harvested, their seeds naturally fall to the ground from the once bountiful stalks. Lying dormant through the dark cycle, they will gather life force to breakthrough the soil’s surface come spring. We also plant our personal seeds during this turn of the wheel with intentions to begin anew, shedding old skin and eventually rising stronger from the ashes of our outworn ways in spring’s first light. The cycle gradually darkens; we navigate the steps downward even further into the safety of Mother’s womb, bidding farewell to the setting sun and welcoming the rebirth we know is to come. It’s all part of the cycle of life, birth, death and rebirth. Like the harvested and browning vines, part of us dies and turns to ashes, protecting and fertilizing the ground for planting later in the cycle. And as the dying chaffs lie in the fields awaiting transport to the Otherworld, the veils lift, opening the gateway for our ancestors’ momentary return. They come back through the dimensions to celebrate with us one last time. We honor them here, on our terms, on our human turf, before they journey beyond our reach, before they ascend into the next house of existence. The celebration of Samhain is a feast of thanksgiving; all are welcome! Lighting our personal candles at last, from the courage of the community flame, we silently walk the labyrinth, spiraling inward step by step. When eve turns to night and night to dawn, food and energy is stored for the long, deep season of winter. Once inside the cave, our candle flame flickers, its beacon lighting the way as we begin the slow journey homeward. This tiny flame of recognition reminds us why we are here in this place of peaceful rest and healing, exploring our shadow worlds until the Wheel turns again. Ceridwen, the witch hag and crone, is the Celtic Goddess of Samhain who holds the powers of the darkening moon, transformation and rebirth. Each year at this time she guides us into the Underworld to meet our shadow, to employ patience, reminding us of what is hidden while supporting us on our inward journey toward self-knowledge. To progress, we must embrace all potentialities of our beingness, especially that which lies lonely in the darkness, waiting for a light to shine into its dusty corners. Ceridwen shows us how to gather the energy from our shadow, bringing it to light, becoming strong through our vulnerabilities. A Welsh grain Goddess, she is the also the feminine archetype of inspiration, Celtic mythology, and creativity. Ceridwen rules the cycles of life: birth, death and rebirth; human gestation; and the Wheel of the Year, as a chalice of both endings and beginnings in our seasonal cycles. The dark goddess’ inherent symbolism supports transformation and is represented by the story of her son, Afagddu who was born hideously ugly and uninspired. In her desire to heal him of these ills, she creates a batch of wisdom and inspiration in her magical cauldron using fresh herbs grown during each of the eight seasons on the Wheel of the Year. In honoring and embracing each of the cycles, this transformational potion was brewed and stirred for a year and a day to be properly alchemized. Ceridwen hired both a blind fire tender and a boy named Gwion to help stir the pot. While stirring, three drops of the potion dropped onto on Gwion’s thumb. Unfortunately, the first three drops contained magic and the remainder in the cauldron was poisonous. Like anyone else, Gwion licked off the steaming potion and instantly received the gifts of wisdom and universal knowledge, leaving Ceridwen without a solution. Incredibly angry after loosing all her work to save her own son, she chased Gwion all over the countryside. He ran and he ran, along the way shape shifting into many forms. He became a rabbit, and she transformed into a greyhound. When he dove into the river, becoming a fish, she was suddenly an otter. Then he changed into a bird and she a hawk, somehow always knowing what was next. At last he shape shifted into a grain of corn, and just a quickly she was a hen and ate him. For nine months the grain grew in her pregnant belly and she swore to kill him upon his birth. As Ceridwen gazed upon the baby boy, too beautiful to harm, she decided instead to wrap him in a sealskin bag, and threw him into the sea. Soon rescued by a Welsh prince who eventually named the baby Taliesin, he lived on to be one of the greatest Celtic bards of all time. Hail to Ceridwen! We stand at the cross quarter of Samhain, at the precipice of our own personal darkness, calling on you Ceridwen for strength and guidance in our next step. We honor your expertise and courage in your constant embrace of the shadow in all things. May we become, as you, a master of our human cycles, the harvest and the planting, both beginnings and endings. Like you we hold the potential to be a lover of our shadow and to fully embrace each facet of ourselves as they relate to the elements, the directions and the constant turn of the wheel. Hail to the Northwest, the water as it moves from the surface into the depths of the underground aquifers. When it reaches our inner most cave, we thirstily drink in the unknown, that which is a blend of light and dark, water and soil. We taste the gritty clumps, yet when shaken and stirred in the cauldron of our inner waters and emotions, we are able to stomach the poison. Inherently we know how to transmute its killing effect, turning life to death, and then into rebirth. Welcome dark goddess. It is time we welcome ourselves into the darkening moons of cool transformation. This was first posted in 2012 as a Newsletter Sidebar to Elementals. Links here may have been disconnected. If you’d like more information about the courses, programs and audios, please email us and we’ll be happy to fill you in! We begin here with a some basic anatomy: both spiritual and physiological, as well as few simple audios to boost your practice, assisting your stress reduction and management. One of the keys to integrating body and spirit lies in our autonomic nervous system. This is part of our body-spirit communication. Here are some nuts and bolts of this very important biological communication system and its energetic counterparts. The autonomic nervous system (ANS) is broken into two parts: the sympathetic branch which triggers the fight or flight impulse and mobilizes resources to act under stress; and the parasympathetic branch which activates our natural capacity for relaxation, digestion, regulation of internal organs and anything that happens while the body is at rest. Since the human body is equipped with two facets of the ANS, we utilize both in concert with one another, and need both to survive. In energetic terms, the ANS mirrors our masculine and feminine lines of connection between the upper and lower dantiens (Taoist term for primary energy centers), the root and navel with the brow chakras. These two facets are also represented in Hermes’ staff of Aesclepion entwined by two serpents. The image of the autonomic nervous system comes from Wikipedia. In yogic terms, these lines are called nadis, which are energetic rivers or channels through which subtle body energies flow. There are three main channels: Sushumna is the central channel and is reflected physically in the central nervous system; Ida and Pingala relate to the ANS, masculine and feminine energies. Feminine energy is lunar, cool, blue, receptive, shadowy and is associated with Ida; while Pingala, the masculine energy, is hot, red or white, light, active, and solar. In Taoism, these same two lines are commonly known as Yin and Yang, along with all minor meridian channels designated as rivers of Yin or Yang. The corresponding elements in western medical science and anatomical drawings identify anything blue (nerves,veins) as afferent or inward, leading into the center; anything red (arteries, nerves) is efferent or outward, moving away from center to create an effect. This image of Ida & Pingala originates at the Power of Kundalini. In our bodies, afference and efference happen simultaneously as an integral, possibly crucial, piece of our body’s rhythms. Blood moves toward the heart and away from the heart; nerve impulses run toward the central nervous system and into the extremities; we operate in a constant active and receptive dance throughout our day. Everything is set up for perfect cyclical rhythms. Until, of course we become stressed and then it all shifts.What actually triggers the systemic changeover into stress is often unconscious, though we know that the imbalance creates even more stress across the board. If we were in a constant state of efference, our heart would not receive blood; our extremities would swell up, eventually depleting our life blood and energy, creating secondary stress and a state of greatly diminished life force. This is seen physiologically through adrenal burnout as well; emotionally and mentally through misinterpretation, mental and emotional disorders, brain chemistry imbalance and depletion of our essential minerals and brain food reserves. Again, it’s a cycle, and because the body always seeks stasis, any form of disruption in our natural rhythms leads to excessive cycling and more stress. We can change our chemistry, our natural rhythms and our endocrine balance just by over thinking and or emotional indulgence. On the other hand, if we’re in a constant state of afference, we could become overwhelmed by foreign energies, the heart would flood with blood, our limbs would loose sensation becoming weak, we’d get sluggish, lethargic and spend much of our time wallowing. Similar changes would happen metaphysically or energetically when we open ourselves up to an extreme, allowing others to plug into our auric fields. Ironically, too much receptivity can also create stress. The key is balance and integration, and what Carl Jung refers to as individuation: the integration of masculine and feminine principles. While Jung was probably referring to this psycho-spiritually, we can apply his concepts across the board because the head bone’s connected to heart bone, and all facets of beingness influence one another. Imbalance on any level is stressful for the human physiology, the emotional and mental constitution, as well as spiritually. Stress can be addressed from any level and create results on all others. For example, we can find a way to slow our minds and this will be an effective remedy for emotional distress, physical tension and spiritual or energetic integration. Or, you could engage in a restorative yoga practice to effect change in the emotional, mental and spiritual realms as well. With any immersion, there are always varying depths of exploration and need for fairly constant attention, especially if the stress is chronic and environmental. There are many different methods for stress relief, management and reduction, though not so many ways to truly abate stress and balance the ANS. Here are some ideas for different levels of commitment or engagement; you can choose how and where you’d like to begin focus your energies and take your next step. The audios build on each other in this order: Grounding to Anchoring to Vitality. Stress Relief: taking a break, swimming on a hot day, going for a walk in the woods, listening to calming music, taking a sea salt bath, deep breathing, an easy restorative yoga class. You may temporally access the following audios at Energetic Connection Podcast Page. A new link will be posted in the next 30 days. Stress Reduction: the ongoing result of stress relieving exercises. Listen to this audio on Grounding. Stress Management: regular long term practice of stress relief and integration of stress reduction experiences; a clearer place of integration and ability to find stress relief on the fly; conscious intention and attention. Listen to this audio on Anchoring. Stress Abatement: rewiring the nervous system completely, creating a new neural network for calm and relaxation; use of stress relief, reduction and management methods with a deeper focus and spiritual intention. Listen to this audio on Vitality. First posted in Summer 2012. The links here may be disconnected, so if you’d like more information about our courses, programs & audios, please feel free to email us. On the Celtic Wheel of the Year, Summer actually begins on May 1st with Beltane. Solstice, or Mid-Summer, is the exact point of the Sun’s highest light in the annual cycle. It is from this pinnacle that Goddess Sulis holds the balance of fire and water, while the Sun blasts open the doors to our outer world, encouraging celebration, cleansing, transformation and play. This year Summer Solstice peaked on June 21st at 3:16 Mountain Time. Further along the Wheel, Lughnasadh is traditionally about 6 weeks later on August 1. Long ago, and quite possibly in another dimension, Lugh honored his foster mother, Tailtiu, for her prolific planting of Ireland. At this point on the Wheel, we celebrate the first harvest of fruits, flowers and bountiful grain crops. Also known as Lammas, or loaf-mass, Lughnasadh calls in the time when the sun begins its path down into darkness once again. The Wheel of the Year makes its way around the southern bend of Summer Solstice into a standoff with Winter. At the Sun’s highest point,its light is now still a warm and building Yang energy that encourages our attention outward. Easing out the door slowly through the summer cycle we encounter our child-like sensuality. As the doorway slowly opens wider, the light bleeds even further through the crack. Taking in the smells and sounds of this new season, we celebrate the full opening as we embrace our bodies, singing and dancing as the heat finally bakes us from the inside out. Pulling on the creaks and the cold, the stagnancy deep in our bones finally dissipates. Nature expresses effortlessly through us while we run and play in this time of great and rapid growth. In the Summer, we are driven by the element of Fire, and in balance, we call on the element of Water and other cool, Moon-like qualities to meet this most potent and natural form of masculine energy. Not yet edgy, the Sun God couples with the purest feminine, Cancerian energies and the the archetypal Goddesses of the season. This image of Sulis was found through Google Images. Click on the word “Sulis” to go to The Mosaic Maker. As Queen, Sulis leads the way, holding the polarities of Fire and Water in her making. Masculine and feminine, sun and moon, she is one with herself, a completely individuated female who expertly guides us further into the light. With her, we move beyond our known borders, searching until we reach equal darkness once the Fall cycle begins. At Summer Solstice we look to the South where the fires of transformation burn; songs of life and its sweet melodies dance on the breeze. A chorus of frogs and birds, two and four-leggeds, everyone harmonizes, calling out in enthusiasm. The sounds of the rain falling, percussive-like in the background, entrance us like drumbeats to remind us that all is not lazy here and we continue to create shifts in our consciousness effortlessly while we play. The fresh cleansing smells–combined with the pounding, snapping sounds of water falling on Earth beneath the Heavens–excavate the tunnel between our conscious and subconscious minds. At Solstice, we awaken more clearly to our mythical memories. On this balance point, we stir our desires. With courage to look into the original mirror, the ocean’s depths, seeing our own reflections. In absence of the sea, we find it in the sky, pouring watery energy down from the heavens. The Summer expands time and space, so we listen to sounds of the sea in the sky, and the ringing call of the Goddess who holds all things in equanimity. Hail to the blue heron who carries us through the gateway; hail to the blue green sea reflected in the sky; hail to the Queen of emotion, the mistress of compassion, for witnessing our dive. May they reveal our innermost feelings, our deepest emotions and bring them to the surface for expression and healing. Hail to the Sun whose fiery light calls in the soul of the Water at Summer Solstice. Sulis with your eye wide open, help us see our individual flame, shining light on the entrance so clearly. Open the gate so we can dive with you into the healing spring waters, and the sea inside. Guide us; show us the way as we plumb and explore our depths on this journey toward the light, health and wholeness. You carry both the flame and the spring of life, Sulis; we call on you to choreograph this Water dance of sensitivity, we call on you to give us strength as we walk through the Fire. Flowing, yet deliberate in our actions, we glide, our heads above water, moving over the rapids with grace and agility. So multi-faceted and unbridled, our path seems incredibly perilous. Yet as water, we move effortlessly fast around the rocks, buoyant and spontaneous. At times we feel aimless in our search and we drift along waiting and wanting to fill something up. At times our Fire is so overwhelming, we find ourselves standing in dried-up riverbeds, breathing in the dust of our intensity and our destructive natures. When we stay our course though, powerful in the stillness, the vessel appears and we are complete. Sun to Moon, Heaven to Earth, masculine to feminine, Yin to Yang, we are full and yet we are empty simultaneously. Ease is our state of mind. As we move with you, our trust grows and our own eye expands. We can now see how you take us over the hidden boulders, through whirlpools that spin us around and frequently take our breath away; sometimes we are even at edge of death. As our own eye opens, we see that going with the flow takes us places we’ve never dreamed of before, out of our safe little streams into the rushing, pulsing rivers of the deep. Take a moment to relax, lying down on your back. Use props under your head and knees if you like. Breath naturally for several inhalations and exhalations, letting your bones be heavy, sinking into the floor; allow your eyes to drop to the back of your head. If you desire, breathe in through your nose and out through your mouth–even somewhat forcefully for a bit–to release stagnant energies. Then, breathe naturally and quietly through your nose. As you breathe into your nose, feel the air moving from the nasal passages, down past your throat, down through your spine. Repeat this several times. As you breathe out, listen to the air passing through, brushing all sides of your throat like a wind; it’s a little like snoring. Breathe in and out through this place in the back of your throat; it’s like listening to the ocean in a huge conch shell. Now imagine you are floating on a lake. Keep breathing, continuing to listen to the sea inside. Allow your breath to expand into the depth, the width and length of this lake; watch as your breath moves in all directions, like little waves lapping onto the shores. Feel the mist on your skin, penetrating and entering your pores. Feel the water under your skin; see the clear crystal blue quality of its energy moving through you. This water flows through your veins and nerve pathways, through your subtle energy channels, your meridians and through your fascia. It occupies the space between the layers of your aura. Your breath becomes the rivers, the tides and currents moving through all of your energy channels. Feel the water surrounding your bones and vital organs, moving into your cells, cleansing and purifying, flowing, open and receptive. You are the ocean. Feel the water moving up your spine, pooling in each chakra along the way, expanding your intuition as it reaches your head, opening your eye. Feel it cooling your brain as the water moves up from your kidneys, calming the Fire in your head. Let this watery breath fountain out through your crown and into your aura. Feel it moving down into your arms and legs, it also fountains out your soles and palms. Feel this loving water element healing your emotional body. Feel your own vitality and life force quicken as you merge with the water on the planet. Be still here as long as you like. When you’re ready, bring your knees to your chest, roll over to the right and lie still for a bit longer. When you are ready, sit up. Sit still, breathe and feel the sea inside; when you are ready, stand up. Water is always here, inside your body; its constant state of motility healing and purifying everywhere it goes. Lughnasadh is the celebration of the Mother as she offers up the abundance of her feminine nature for humankind. In the feast of the fruits and flowers, we call on the elements of water and earth to honor the wells and the mountains; the first harvest, and the transition of Summer into Fall. Here we honor both gods and goddesses in celebration of the shadow and the light, the mysteries, the warmth of the Sun and the cool breath of the Moon at night. I have searched for the artist who created this image of Tailtiu and have come up empty handed. If anyone knows the artist, please let me know and I will give credit here. As the Wheel of the Year turns upward from the South into the West, we meet Lugh (lookgh) a highly skilled immortal who having traveled far and wide experiencing many trials, comes back to live at Tara, the hill of kings. Born of the Tuatha De Danann (tuaay die danan), a tribe known as the gods of humanity, he makes his way home after years of fosterage and helps his people wrestle Ireland from the rule of the Fomoraig (Fomorians), the gods of chaos and wild nature. Lugh is a god of light, and nasadh is the binding promise he made to his foster mother, Tailtiu, Queen of the Fir Bolg tribe that preceded even the Tuatha De Danann. As the Queen lay dying of exhaustion from clearing the whole of Ireland for agriculture, Lughnasadh, was born as her funereal festival. More than just an acknowledgment of a mother passing into the otherworld, Lughnasadh is symbolic of the agreement between all living beings and our planet, an honoring of the last sheath of grain, woven through corn husks in the image of woman. These corn dollies were the effigies and receptacles for all woes and shadow states of the tribe that were absorbed and held throughout the year by women. These energies were finally purged at Lughnasadh into the corn dolls during their making, then burned to transmute the energy, using the dross to fertilize new ground for Spring planting. Feasting on the harvest; singing and dancing to celebrate hand-fasting; competitive games for the men to prove their physical prowess was equal to that of Lugh; the long arms of heat from bonfires that lit up the night sky, symbolizing the powerful light of the Sun in Lugh; and the distinctive yet humble torches carried only by goddesses who’d been into the underworld and back again. This is the festival of victory–the brilliant light against the powers of darkness–as the Wheel turns once more into the West. Now begins the first cycle of Fall. Lughnasadh is the celebration of the Mother as she readies to birth her nature for humankind. It is the feast of the fruits and flowers, calling on the elements of water and earth to honor the wells and the mountains; the first harvest and the transition of Summer into Fall. Here we honor both gods and goddesses in celebration of the shadow and the light, the mysteries, the warmth of the Sun and the cool cycles of the Moon. As the Wheel of the Year turns upward from the South into the West, we meet Lugh (lookgh) a highly skilled immortal who eventually, after many trials, comes back to live at Tara, hill of kings. Born of the Tuatha De Danann (tuaoa die danan), a tribe known as the gods of humanity, he makes his way home after years of fosterage and helps his people wrestle Ireland from the rule of the Fomoraig (Fomorians), the gods of chaos and wild nature. Feasting on the harvest; singing and dancing to celebrate hand-fasting; competitive games for the men to prove their physical prowess was equal to that of Lugh; the long arms of heat from bonfires that lit up the night sky, symbolizing the powerful light of the Sun in Lugh, and the torches carried only by goddesses who’d been into the underworld and back again. This is the festival of victory–the brilliant light against the powers of darkness–as the Wheel turns once more into the West. Maker of the seasons and birth mother of the Wheel, Demeter is a Greek triple goddess; mother to Persephone, daughter of Hecate. As the goddess of grain she offers the food of life to humans. She is the goddess of all seasons, giving us birth in the Spring, life in the Summer and death in the Fall; then she gives us an opportunity for rebirth again after meeting our shadows in the lonely months of Winter. Three faces of the goddess, three phases of the moon, Demeter, as creatrix of the seasons, you personify the birth, the love and the death. You are the mother who rescues herself as the daughter Persephone when she drinks the inter-dimensional brew. Meeting grandmother Hecate in the shadowy darkness of her own underworld, you become sage and expansive in a place where until now, only Hades has flourished. While stumbling about in the dark, your angry stick stirs the cauldron of remembering. Drop by drop– because mother courage effortlessly drags the lost maiden from her cowering place under the blight of the crone–the essential brew of life dribbles onto stone. It transforms youth into maturity and love to a Queen’s reign. Steamy and sizzling, the ground cracks wide open under your feet. As rock disintegrates into dust, you fall and your fearful, thunderous rage ignites chaotic static in the air. It fills the sky with bolts of light, surprisingly and safely guiding you through the expanding crevasse into a gateway. Though you tumble and bounce, still trying to fly, your eyes are flashing and keen. You scan, searching for the edges of a veil that exists for you no more. Now living in the world of humans, you acquiesce and merge. You are the perfect blend of ingredients for the life residing within you as you carry the eternal torch of those who’ve travelled inward and downward, emerging alive and integrated. In your essence, you remain a Queen. You are the triple goddess; all things come from you, you are all things. Demeter you turn the wheel; you created and now you control the seasons. You are the midwife for sister Ceres, to whom Ker is born, the babe and the first stalk of grain. From this comes the first loaf, the first bread and the first taste of the body, enlightened. We call on you Demeter, to guide us to see the abundance of your cycles, and to touch the gratitude in our souls. We ask for your blessings on our inner food at harvest time, on the bubbling elixirs for transformation and growth. Mother, may we perfect the tilling of our soil, plant our seeds on fertile ground; may we please you and may you always be here to remove in us what does not belong to you. Find a comfortable seat, close your eyes, put your feet on the floor and breathe into the bottom of your feet, gently calling it into your legs and pelvis. Let the breath pool in the pelvic floor, filling it up with air and then releasing it on the exhale. Now feel the Earth energy moving up from its core into your feet chakras as you inhale, into the bubbling springs of life, moving through your legs into your Root Chakra and back down into the Earth. Witness the Earth energy carving and defining its channels, streaming from the bottom of your feet, through your legs, passing the ankle, knee and hip joints; through the Root Chakra and into the Earth again. Observe and notice how the Earth energy clears stagnant energy from your lower body, taking all things foreign or past-time as it moves out and back into the center of the Earth. As you exhale, send the unwanted energy down deep into the Mother with great gratitude. She will transmute your dross to gold, giving birth to new and blessed forms, the fruits of your essence. Continue to offer her your dried and dead stalks, slashing and burning, fertilizing and making room for new seedlings of growth. Breathe in and breathe out, sending gratitude for each cycle of nourishing inspiration and the die-off with expiration. More so most recently, our planet works overtime, flinging elemental energies around wildly as she expresses her stress and power. Stern and loud, her voice speaks to us about our own rouge expressions, reflecting back the chaos within our human beingness. She not only asks us to handle more and more external change as our cells re-call the ancient ways and how then, we acknowledged our lack of control over the elements. She also begs us to transform our inner terrain, and when we don’t have ears to hear, we feel the roar of her soul vibrating through our bones. Whether planetary or not, stress is elemental; it’s built into our human design, residing deep within the bones of our DNA. We’re programmed with both the ability to respond to, and create, stress as an integral part of our nervous system as it runs through and connects our physical and subtle bodies. Stress is the hot, red, reactive, efferent impulse of control and desire for power over our environment. Yes, and in the moments when it’s a bit quieter and more productive, it’s also the active, masculine side of our genetic make-up; even women have this energetic and physiological construct. I’m sure you know it well. Admit it or not, we’ve all experienced stress and or masculine energy in different moments throughout life and have a lot of memories about how it feels or felt to be stressed and or empowered. I bet you can pull up a mental image picture or a feeling of both pretty easily. Which of provides the kind of physical sensation, emotion or thought patterns that you’d like to repeat, over and over in your life? How do you want to embrace your masculinity (whether male or female)? How do you want to be in relationship with this phenomenon and what side of the line do you choose? Will you continue to re-create and experience the edgy sides of stress, or will you call up memories of rest and relaxation, perpetuating ease and gentler sensations instead? Would you rather feel the cool, blue, responsive afference and calming imagery? Maybe someplace inside of us, there’s a balance point we can register in our wiring. This image of the Redwood grove is my own. Let’s start with some habits. Does any of this sound familiar? 1. Striving (struggling) to make things happen. 2. Completing everything so there’s nothing to do before going to bed or on a trip. Or, doing one last thing before leaving the house. 3. Rushing from one appointment to the next. 4. Hurrying up so you can relax. 5. Driving fast everywhere you go. 8. Using power over people in your life. These are all very basic and fairly normal stress states, though they’re really only symptoms of what lies much deeper within us. Will you be one to discover what’s underneath the sprawling superficial layers that cover the root system? If we know we’re creating more stress by acting in these ways, WHY do we perpetuate it? Or do we even notice? Many of us actually like stress because it’s in our nature to push the envelope. Just how far, and in what ways can we push it for purposes of learning and growing before it truly becomes a stress monster or even an addiction? The energy of our human composite is something akin to creation and destruction, expansion and boundaries, masculine and feminine principles. These are the foundations from which we use stress to evolve naturally, though in this era we sometimes push our minds and bodies so far with the constant pressure of the media and the introduction of newer and grander technologies, we fry our brains and injure our constitutions. We can break Yin and Yang into individual parts and see how extreme masculine energy quickly grows into that monster. It’s symptoms are over-powering, over-acting, pushiness & bulldozing, willfulness, over-achievement, control, and are often a result of our resistance to flowing with our natural rhythms and soul forces. This monster feeds on the distance or space we create between Yin and Yang, each other, and the amount of time and energy we expend jumping from one construct to the other searching for an experience of balance and integration. Then destroy it all over, again and again. If we were more emergent and a bit more curious, as opposed to distracted and compulsive, would we be so stressed? Or would we be bored from a lack of polarized definitions? Stress is elemental in geological, philosophical, sociological, anthroposophical, physiological and metaphysical ways. Because at best, we humans are ever the alchemists, striving to harness, transform and control the elements of earth, wind, water, fire, space, our minds and emotion; we create lots of chaos in everything we do. And with that we leave a lot of entropy. Some of this chaos and entropy are immediately noticeable, and when we are awake and present, we use the entropy for our evolution. Yet, much of it remains un-recycled, and has long standing repercussions, even covert reactions and effects that bubble up intermittently and often appear centuries down the historical pathway in places we’d never think to look. On a purely physical level, think about nuclear energy; it epitomizes stress from within its creation, to the use of its power, to the day it becomes destabilized like in Japan or Three Mile Island, and of course into the earthly elements for decades and centuries to follow. Directional cue: Don’t waste too much time on superficial mundane meanderings here; think back to the basic studies of geology, physiology, philosophy, anthroposophy, sociology and metaphysics. How does stress, chaos and entropy create more stress on the related and subterranean levels inside of you? It’s in us to be stressed, and if we aren’t already naturally and actively engaged in the practice of stress, we make it so, everywhere we go. We wear stress like a trophy in every season by resisting what we’ve already chosen–human form, earth life, our families, jobs and more. And yet, it’s also in us to be free and relaxed, if only we could trust and allow the Sun to shine, the winds to blow, the earth to quake and the rains to pour without our help and interference. If we did allow it, if we did use our will coupled with clear thought and inspiration, what would be able to manifest? If we used our God-given gifts, we might just be more balanced! This resistance runs deep, though. On the outside it may look a lot like certainty, knowingness, intelligence and actualization, especially when we look at ourselves in the mirror. Our minds see what they want to see. Sometimes it holds all those wonderful qualities, that’s true. Yet when it doesn’t, or even when we’re brave enough to slow down to experience a different rhythm–an internal rhythm, one that’s linked to the rhythms and tides of our planet and beyond–then we know there’s something off beat inside of us. Until we change our pace for a mere moment, until we live without extreme stress and breathe a bit more consciously, we’ll never know this other option exists. It’s also in us to be stressed in the right circumstances; that’s the true rhythmic and elemental piece. Like food, if we’re addicted to stress, how do we find balance without becoming overweight, diabetic or anorexic; and in this instance, complacent and apathetic or dead in the face of a kumodo dragon on some movie screen? In simple terms, here’s the way our system expresses stress: the fore brain perceives a potentially dangerous situation and transmits this information to the hypothalamus deep in the midbrain. The hypothalamus sends a message via the sympathetic (masculine, Yang, Sun) branch of the Autonomic Nervous System (ANS) to the endocrine system (pituitary, adrenals) which then pumps up the appropriate chemicals and limbs to deal with this danger. In the end, it’s usually adrenalin that overtakes our systems making us feel fast, strong and powerful, able to overcome anything. So we run away, or we stand and take on the challenge. This is better known as fight or flight and it takes us right back to our mammalian and sometimes reptilian patterns. This image of the autonomic nervous system originates here. How wonderful to feel so formidable! Our ego-minds get engaged encouraging us saying, “let’s do that again!” And so the cycle perpetuates. Read more about the cycle of stress. Get free visualization audio downloads and read more about theAutonomic Nervous System here. I’ve learned a little lately by watching myself create stress out of thin air. Because of that self observation, now, instead of making haste when I’m at home feeding the cats or making dinner, I move thoughtfully and slowly; I breathe while I work; I drive the speed limit more and more, and I’ve begun to give myself time in between engagements. These are the simple things I do to shift my programming. This image of the Crescent City, CA lighthouse is my own. One of the sources for my stress, I’ve fairly recently discovered, is driven by a need to please. Now this isn’t profound, yet it’s something we all do at some level. It can be incredibly insidious. We often ignore and or we continue to find deeper levels of it. It’s not hard to spot this trait in others, though our own blind spots get bigger as we get stiffer. Take a moment to honestly inquire within about how you try to please other people. Do you see it? Why do you do this? How does it appear, in what situations, and where does it come from? Its origins are probably linked to a deep desire for relationship, fear of losing those relationships or some other deeply rooted survival concern which honestly could be just as stressful as the obsessive compulsive act of pleasing. Even the relationship you have with your personal image, your work and other definitions in the world are at stake here. Read more about Stress & Self Reflection. De-stress and balance yourself. Check out our new meditation and visualization CD, “Emergence.” It’s an experiential series exploring the energies of Sun, Moon and Synergy. You can purchase and download it immediately by clicking here. We offer self-study in 6, 12 and 14-week courses as well as single sessions in all courses if all you want is a little bite.